Description: Leading Elephant sytle, this Northbound Manifest rolls Over the Palmer Divide. Description: S LPCLHT1-10 With BNSF 7639 & BNSF 4767 on the point. BNSF 4185 & BNSF 8198 are the rear DPU's with 86 Loads, 9807 Tons 8023 Feet. Photographed at 15:36. Description: S LPCLHT1-10 With BNSF 7639 & BNSF 4767 on the point. BNSF 4185 & BNSF 8198 are the rear DPU's with 86 Loads, 9807 Tons 8023 Feet. Photographed at 15:54. Description: S LPCLHT1-10 With BNSF 7639 & BNSF 4767 on the point. BNSF 4185 & BNSF 8198 are the rear DPU's with 86 Loads, 9807 Tons 8023 Feet. Photographed at 15:55. Description: Running very late in the afternoon Q380 passes Willoughby catching the late rays of the sun. Description: Sitting in the 36th street engine shop. Nearly untouched. Description: Nice to see the green giants still working. 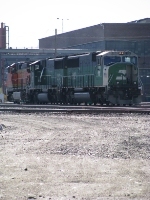 Description: Railfanning with my girlfriend, Q388 like usual has BNSF power but today ex BN also is in the picture. Description: A excellent consist leads V-CHCTAC west through Naperville. Description: What a classic lashup here! The V-CHCTAC heads west north of Prairie du Chien behind two nice units that once ruled this stretch of railroad territory!